The competition began in 1945 under the direction of William Ackerman. It began with only 11 groups and was performed on campus at UCLA's Royce Hall. In the beginning years, the competition was composed mainly of fraternity singing groups, serenading their sorority counterparts. The first of these groups to win the competition was a barbershop quartet from the Phi Kappa Psi fraternity. During the 1950s and 1960s, the competition grew quickly and outgrew Royce Hall. It was then, that Spring Sing gained its popularity and notoriety within the Los Angeles area, as it moved to the Hollywood Bowl. During these years, up to 15,000 Bruins, family, friends, and locals witnessed the competition each year. Also added to the mix were celebrity judges and masters of ceremonies - including Ronald Reagan in 1952. The competition peaked in the late 60's and took an 8-year hiatus during the 70's until student and alumni interest revived the event (on campus this time) in 1978. In 1986, the UCLA Student Alumni Association took over the event and moved the event to the Los Angeles Tennis Center in 1989, eventually returning the competition back to its previous glory. Today, the competition has expanded from its original version of fraternity singing groups, to over 15 artists grouped in 6 different categories (Solo, Duet, A Cappella, Band, Production, Exhibition). Each category (save Exhibition) is judged and a winner is selected for each (from which an overall winner is chosen to receive the "Northern California Alumni Grand Sweepstakes Award"). In addition to the talent aspect of Spring Sing today, the overall production has been turned into entertainment with the inception of the Company - a group of UCLA students who perform skits, songs and parodies in between each act as a way of introducing the next act. According to their website, they are "a group of the most hilarious and creative people on this campus who live for the spotlight and the opportunity to make an audience crack up." Past performers from Spring Sing include: Grammy nominated members of Maroon 5, who were defeated in 2000 by Barely Manilow, Tyrone Wells, and Grammy-nominated singer Sara Bareilles. 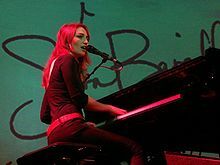 Bareilles won Spring Sing twice, in 2002 and 2003. In 2006, Mikey G and Dan from Danville won the award for best duet and Best Overall Entry - the duo went on to form the band, Lady Danville. In 2007, Jarell Perry and the Ambassadors won the Las Doñas Award for Best Band Entry. Katie Boeck won the Mortar Board Award for Best Solo Entry and the Northern California Alumni Grand Sweepstakes Award for the Best Overall Entry in 2007, 2008, and 2009. Nasim Pedrad (Saturday Night Live) was a member of the Spring Sing Company in 2003. 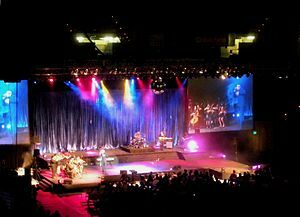 Since its revival, Spring Sing was held at UCLA's Los Angeles Tennis Center, but due to the overwhelming demand and popularity of the show, it was moved in 2009 to much larger venue Pauley Pavilion, providing the opportunity for more to experience the cherished campus tradition. "Spring Sing 2009 Rock Pauley" made its return debut in Pauley Pavilion on May 8, 2009 and also in 2010 on May 14, 2010. Due to construction on Pauley Pavilion, Spring Sing returned to UCLA's Los Angeles Tennis Center on May 20, 2011. Spring Sing returned to newly renovated Pauley Pavilion on May 17, 2013 to set a record breaking attendance for The Student Alumni Association. Northern California Alumni Grand Sweepstakes Award (Overall) Jon Augustine – “New York State of Mind” Willie Chase, "Open Seas" Mikey G and Dan from Danville, "Cast Away." Katie Boeck, "Colorblind" Katie Boeck, "White Lies" Katie Boeck, "Your Part" DJ Harper, "I Call It Love" Courtney Randall, "The One" Alto, "Vocable" Bruin Harmony "Ignition (Remix)" Alex Liu and Eric Jung, "Notice You" Fine Print Laura Savage "Once" Eva B. Ross & David Miller, "Chicago" Hayden Everett & Caroline Pernick, "For I Fear"
UCLA Affiliates Award (Production) Alpha Gamma Omega & Chi Omega, "The Bruin Way" Chi Omega and Alpha Gamma Omega "When Joe Met Josie" Pi Kappa Phi & Delta Gamma, "Alice in Westwoodland" Pi Kappa Phi & Delta Gamma, "Love of the Game" The Strathmore Players, "Jerry Maguire: The Musical" Gleeche, "The Fame of the High School Glee Club" Pi Kappa Phi & Delta Gamma "Candy Land" Omechi, "Hangover: The Musical" HOOLIGAN Theatre Company, "Bruin and the Beast" HOOLIGAN Theatre Company, "The Boy Who Wouldn’t Graduate" HOOLIGAN Theatre Company, "The Bruin King" HOOLIGAN Theatre Company, "School Wars: The Rivalry Awakens" HOOLIGAN Theatre Company, "Out of Time"
Judges Special Award (Honorable mention) The Jumpmen "Jumpmen Jazz" Willie Chase and Jeremy Pagan, "Lying Feet" Trish Johnson, "Without You" Bruin Harmony, "Magic Carpet Ride" Christopher Geno, "Does it Matter?" Katie Boeck, "Real World"
Celebrities have served as judges and master of ceremonies. They have included former President Ronald Reagan (1952), actor Jason Alexander, Fred MacMurray, conductor André Previn, Christopher Gorham (Ugly Betty), Ryan Carnes (Desperate Housewives), Amber Stevens (Greek), Dr. Bill Dorfman (Extreme Makeover), Tatyana Ali (The Fresh Prince of Bel-Air), Sarah Drew (Grey's Anatomy) and Todd White, a member of the lead animation team for "SpongeBob SquarePants". Others were: actors Sean Astin, Ian Buchanan, Dennis Haskins, Andrew Keegan, Tina Majorino, Danica McKellar (The Wonder Years), and Patrick Renna. 2009 judges included model Janice Dickinson, actress Shelley Long, local KNBC-TV newscaster Ted Chen, and Melissa Joan Hart. In recognition of their contributions to American music and in honor of their gift to UCLA, the UCLA Student Alumni Association established the annual George and Ira Gershwin Award for Lifetime Musical Achievement in 1988. In 1936, George and Ira Gershwin adapted the title tune from their musical Strike Up the Band as a new Bruin fight song for the growing university. Lionel Richie said at Spring Sing 2008: "Forget about surviving 30 some-odd years in the music business; Lionel Richie survived 27 years of Nicole Richie". Julie Andrews said at her award ceremony: "Go Bruins. Beat 'SC ... let the Gershwin tunes strike up the band to celebrate every one of those victories." Spring Sing is organized and executed each year by a committee of UCLA students of the Student Alumni Association (SAA) who are selected by the SAA Board of Directors and the UCLA Alumni Association advisors. There are 8 different positions on the Spring Sing committee. Each position carries with it specific responsibilities for the successful implementation of the show. Sasan Ahoraian, Kean Almryde, Shane Billings, Ben Goldsmith, Mark Stewart Iverson, Michelle Lin, Heather Losey, Dylan Matteson, Jackson McNeill, Sydney Pritchett, Jordan Riggs, Regan Riskas, Christine Takaichi, Madison Vanderberg. Shane Billings, Colin Davis, Ben Goldsmith, Steve Greene, Maddy Grubman, Kyle Lau, Jessie Linn, Ashley Morrissey, Dean Otsuka, Jake Perkowski, Kevin Ruane, Madison Vanderberg. "List of "George and Ira Gershwin Award" Recipients". Retrieved 2006-12-25. "UCLA Spring Sing". Retrieved 2006-12-25. "Spring Sing 2009". Retrieved 2009-04-12.